On the heels of a heated duel in Parliament on the Rafale defence deal, Prime Minister Narendra Modi launched an attack on the Congress for allegedly working at the behest of middlemen while in power. Addressing a jam-packed rally at Baripada, Modi assailed the Congress over Christian Michel, dubbing him ‘Michel Mama’ or ‘Michel Uncle’ of the Congress. Michel is an alleged go-between in the AgustaWestland VVIP chopper case. “I do not understand whether the Congress was running the government or its Michel Uncle’s court,” Modi said in a sardonic tone. He went on to say that the investigative agencies would probe all irregularities of those who tried to save the middlemen. 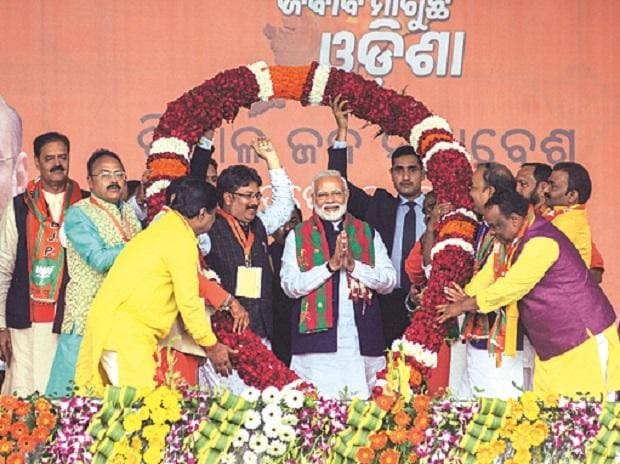 Modi was in Odisha, his second visit to the state in less than a fortnight, to set in motion projects worth over Rs 4,500 crore. The projects include dedication of the Balasore-Haldia-Durgapur section of the Paradip-Haldia-Durgapur LPG pipeline by Indian Oil Corporation, laying of the foundation stone for three highway projects, and inauguration of a multi-modal logistics park (MMLP) and railway projects. Modi commended defence minister Nirmala Sitharaman for her spirited response to the Opposition’s barbs on the Rafale deal. “The country is coming to grips with how a conspiracy was hatched between 2004 and 2014 to weaken the country’s defence forces. Now that our government is bringing the forces of the country out from the conspiracy, it is rattling them (Congress)”, he added. Sitharaman, during a protracted debate in the Parliament on the Rafale deal, junked all graft charges, asserting the defence deal was better on every count and that it would bring Modi back to power.